A lot of bloggers have their own special codes for letting folks know they’re too busy to do regular blogging. I’ve always liked what Mark Evanier does at his NewsFromMe.com site – he posts a photo of a can of Campbell’s soup. If you see a can of Campbell’s soup on his blog, he’s usually way too busy to write a decent posting. Today, I’m posting a photo of a cigarette package to the LOUIE REPORT blog. It’s not that I’m too busy to do a decent posting, although at times it has been so very hectic I have gone for weeks at a time without any new words. I’m not even a fan of smoking, as I do think it’s a vile and stupid habit – one that actually killed my father from emphysema. It’s killed a lot of really good people, and I hate the odor. I’m actually one of those people that’s in favor of very high taxes on these things, just because I’m really tired of this crap. 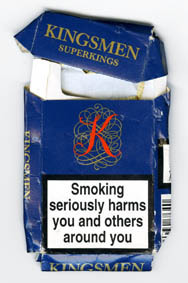 No, I’m posting this photo because it’s a special pack of “Kingsmen” cigarettes. Any product that uses the “Kingsmen” name is something I’m paying close attention to these days. Various bands have called themselves “the Kingsmen” years before the band from Portland, Oregon made it big by performing Richard Berry‘s most popular song. The guy who sent me this empty package of “Kingsmen” cigarettes is a very generous man by the name of Robbie Fischer, who lives in England. Over the years, Robbie has sent me a lot of wonderful gifts, including a 1974 book on the Coasters by Bill Millar (one of the earliest books acknowledging the musical talents of Richard Berry), a book on southern soul by Barney Hoskyns, some musical flyers, memorabilia, and samples of his own music. Robbie was such a big fan of the Kingsmen, and the whole Jack Ely & Courtmen legacy, that he actually named his U.K. band Robbie & The Courtmen as his way of honoring the vocalist that transformed Richard Berry’s song into an international hit. Robbie has also written his share of original music. If you’ve heard Johnny Winter‘s 1991 “Let Me In” album, you’ve probably heard “Medicine Man,” which is one of Robbie’s originals. Robbie’s had a very interesting career, and he’s written me some amazing letters about the music biz. He’s very passionate about the song LOUIE LOUIE, and I’m very honored that he would share his words with me. Perhaps someday, I’ll type up some of these writings, as he’s got some great things to say. Getting back to the smoking thing, I know a lot of people tend to smoke when they’re under pressure, or frustrated. If I did actually smoke, I’d probably be smoking a lot in the past few weeks. Before I headed off for my week-long adventure to the Pacific Northwest and another week at Burning Man, I had yet another computer hard drive crash. Like my hard drive crash in July, it was another LaCie external hard drive that failed. Unfortunately, this was no simple hard drive. This was a large 2 TB RAID array that held a significant portion of my documentary project. I’d like to say I followed my own advice and backed up all of the files before this crash happened, but I’d be lying if I said so. A lot of this data only existed on this big hard drive, so I’m kinda screwed. I’ve had good luck recovering data in the past, but not without a lot of headaches. I can’t afford spend the thousands of dollars required by data recovery services, so I’ve done everything I can to arm myself with the tools to do my own repairs. As LaCie will completely erase the hard drives as part of their 1-year warranty to repair the actual drive enclosure, I have to do what I can to preserve the data. After a lot of nonsense involving various emails and phone calls to the tech support at LaCie, discovering they no longer manufacture this external drive (thus no old drives to swap parts with), buying new internal hard drives, swapping them out on the big RAID enclosure, I was finally able to send out the defective unit back to the headquarters in Oregon for repairs about 10 hours ago. I’m guessing it will take 1-2 weeks to get a working unit back, which will then be a recipient of more surgery as soon as I get it back. I wish I didn’t have to do all this crap. I wish I had working hard drive enclosures that didn’t fall apart on me. I never had this kind of problem with hard drive enclosures from Other World Computing, Western Digital, Seagate, or even the generic Chinese enclosures I bought at some long-gone computer stores in the Silicon Valley. It’s so damned frustrating to deal with all this when I should be editing my documentary. I don’t think I’ll be buying any more LaCie hard drives in the near future.. even if “LaCie” does kinda sound like “LOUIE.” Enough is enough.